The 1st one was a great success and it’s time to do it again! New Location but same great Show! presented by RUSS G EVENTS. 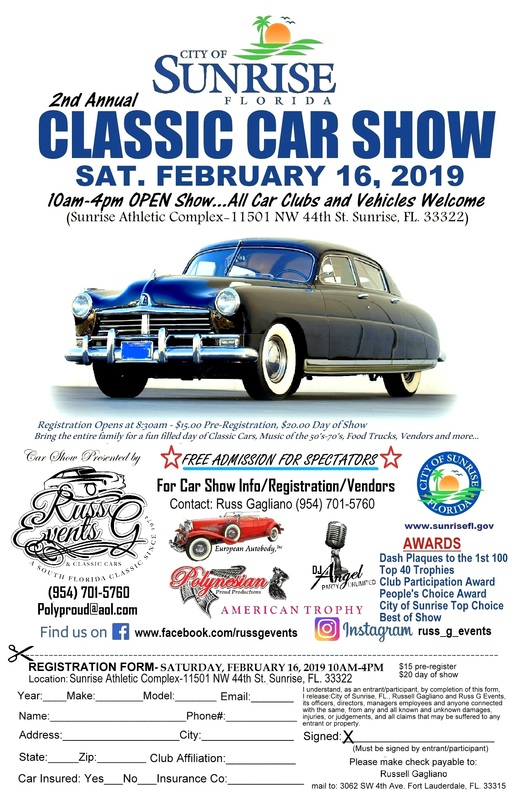 OPEN SHOW-All Car Clubs & Vehicles Welcome! Registration Opens at 8:30am, closes at 12 Noon. Free Admission & Parking for Spectators! Top 40, Dash Plaques to the 1st 100 registered. Club Participation Award, People’s Choice Award, City of Sunrise Top Choice Award & Best of Show Award.